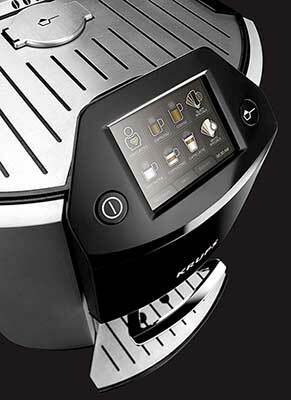 An almost completely automated, advanced one-touch coffee system that still gives you exquisite levels of control if you want it. Recommended for: Anyone, although purists will probably want something a bit more hands-on. Do you love specialty coffee, but don’t want to have to deal with the hassle of grinding, tamping, measuring, and learning all the little tips and tricks of a coffee shop Barista? Are you looking for a machine that allows full digital control over the drink-making process, while maximizing convenience? If you’re reading these words and nodding your head in agreement, then you’re going to love our detailed Krups EA9010 review. While it didn’t get a perfect five-star ratings for us, one of the best aspects of the model is the fact that there are no big, glaring problems or fatal flaws. Our final score is the result of making minor point deductions here and there for a constellation of small complaints, not a glaring omission or design flaw. As such, everything we find “wrong” with this machine is very easy to live with, and given its surprisingly modest price, it will appeal to a huge swath of the market. Honestly, we were shocked at its robust feature set, given the price. It’s easily one of the best values on the market today, in our view. In any case, we’ll go over everything this machine can do in the sections below, and cover its small collection of minor weaknesses so you’ll have a complete picture before making a final purchase decision – let’s get right to it! We’d class this as a medium-sized super automatic coffee machine. It’s not huge by any stretch of the imagination, but with dimensions of 22.8” x 14.9” x 19.5” and weighs 25.6 pounds, if you’re short on kitchen counter space or have low clearance between your countertops and cabinetry, then it might be difficult to find a good home for the unit. One of the first things you’ll notice about the machine though is likely to make you feel a twinge of disappointment. It’s made almost entirely of ABS plastic. While that’s by no means a bad thing, at the price they’re selling the unit for, most people would expect more in the way of stainless steel, with plastic highlights. Looks can be deceiving though, so don’t let the abundance of plastic put you off! The money they saved by using sturdy plastic rather than metal was put to good use and is one of the things that enabled KRUPS to cram as many bleeding edge features into the device while keeping the cost low. The size of the water tank is a very big deal to us because we love our coffee. If you’ve seen the hit TV show NCIS, you’ll notice that the character of Gibbs constantly has a cup of coffee in his hands. That’s us, except we’re that times four, so a big water reservoir is highly convenient. Unfortunately, the Krups coffee machine EA9010 under-delivers in this department. It’s front-loading reservoir only holds 56 ounces. That’s fine if you live alone and are a power drinker, but if you have more than one coffee lover living under your roof, you’re going to have to refill the tank more often than you’d care to. Worse, because of the way this machine’s auto-cleaning cycle works, it uses more water than most other super automatics. We’ll talk more about cleaning in a later section, but for now, just keep in mind that it’s draining the already limited water supply too. Bottom Line: it’s underwhelming. Not fatal. Not a deal breaker, but we’d love to have seen a bigger tank. Virtually eliminates the need to descale your machine. If you want to maximize convenience, use the filter. If you want to minimize cost, run without it. Note that If you opt to install the filter, you’ll need to go into the system menu and tell the machine it’s in place. For all its bells and whistles, it can’t auto-detect the presence of the filter, and if you don’t plug in the date you installed it, it’ll periodically ask you to run a descaling routine anyway, so this is a surprisingly important step! 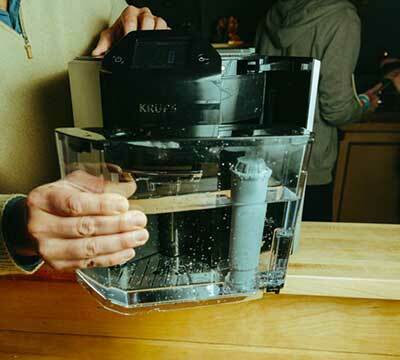 We love almost everything about the way Krups handled the grinder, and only have one medium-sized, and one tiny complaint. Let’s get the complaint out of the way first. It uses a stainless-steel conical burr grinder, and it’s a little on the noisy side. ARGH! We don’t care so much about the noise, but the metal grinder is problematic because stainless steel heats when you use it, which can sometimes burn your grounds and ruin the flavor of whatever drink you’re making. We’d have been more than happy to pay a few extra bucks to get this model with a ceramic grinder. That one complaint aside, we love the way this feature was implemented, and there are some interesting things to talk about here. For one thing, there are no grind settings, or at least not in the conventional sense. Yes, you read that correctly. Almost every other super automatic on the market has multiple grind settings you can select from to better dial in your flavor. You don’t get that here. In a bid to maximize convenience and control, it was removed, although you can influence it by changing your drink settings on the main menu. The two settings, in particular, are shot strength and coffee strength. The higher you raise these (three options for each of those), the finer the coffee ground will be, so indirectly, you’ve still got six settings, it’s just that you tweak them from the control panel, rather than from a dial inside the bean hopper. 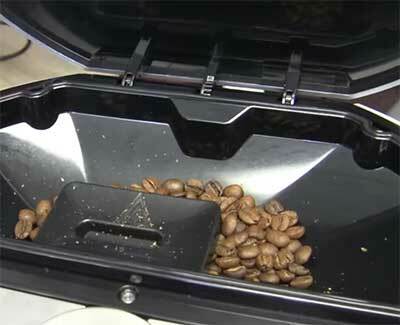 Speaking of the bean hopper, it’s top-loading and holds 8.8 ounces of beans. That’s slightly on the small side, given the size of the water tank, but remember, this machine uses more water than most for automated cleaning routines that we’ll talk about later, so when you factor that in, they’re fairly well matched. That’s a good thing because too often, we’ve seen examples where a company will pair a big water tank with a tiny bean hopper, or vice versa, which is annoying because it means that you’re constantly having to stop what you’re doing to refill one or the other. The Krups EA9010 automatic espresso machine also features a one-touch bypass doser for those times you’d rather not use fresh beans, like for instance, preparing a quick cup of decaf in the evenings. Here again, the company has taken steps to make this as fool proof as possible. Noting that many other manufacturers suffer from the problem of users overfilling the bypass doser, the company designed the bypass doser hatch with a covering that slides into place over the hole that leads down to the brew chamber, creating a bed that the grounds rest in, which limits the amount of pre-ground coffee you can put into the chamber. When you close the hatch, the grounds are released and fall into the brewing chamber for drink preparation. It’s a simple, and simply brilliant solution to a common problem. One final note here is that you can use oily beans with this model! 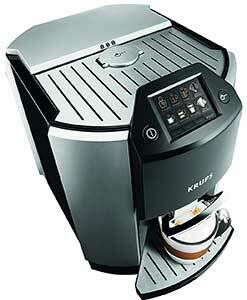 In fact, KRUPS provides an attachment for your bean hopper if you plan to. That’s extremely rare and is yet another point in favor of this machine. Almost every other model on the market warns you away from using Dark Roast beans because the oils will give the grinding burrs no end of trouble, and shorten the life of your machine. If you’re a fan of Dark Roast coffee, that can feel pretty constraining, but it’s not an issue here. Dark Roast lovers, rejoice! 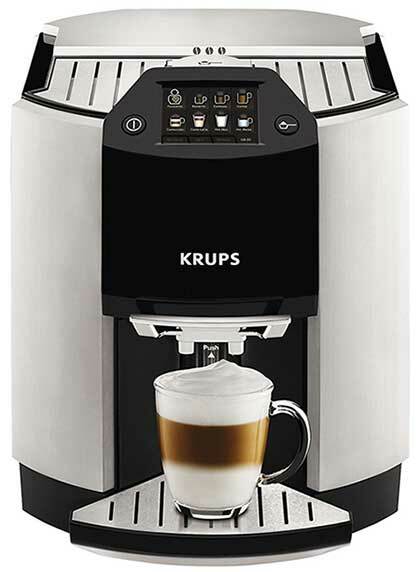 The Krups EA9010 Barista one touch cappuccino super automatic Machine uses a single aluminum boiler, lined with stainless steel and featuring a Thermoblock technology for rapid heating. We’d love to have seen a second boiler, which would have allowed for the simultaneous steaming of milk and brewing of coffee, but honestly, it doesn’t save that much time and would have dramatically increased the price of the machine. Besides, when we get to the milk frothing section, you’ll see that you’d save even less time because of the way the machine is designed, and all you’d be able to do would be to preheat the milk anyway. The presence of the Thermoblock technology minimizes your wait time, in any case, so you’re not going to be sitting around twiddling your thumbs and waiting an inordinate amount of time for your drink of choice. There’s not much to say about this, except that the Krups EA9010 barista does have telescoping coffee spouts that move up and down to accommodate a variety of cup sizes ranging from about 2.5” to 6,” which is a very good thing, and will allow you to use your favorite super-sized coffee cup in most cases. Pro Tip: The position of the coffee spouts matters more than you think in terms of crema! Ideally, you want them just above the lip of your cup. The brewing system on machines like this consist of two things: The brew unit itself, where the coffee magic happens, and the control panel, which is your window into that world. On the Krups One Touch EA 9010, it’s your only window into that world. The machine is designed such that you can’t remove, or even access it, so there’s not much to say on that front. The control panel is another story altogether, and honestly, we’ve never seen a system interface that’s been done better. This machine is so easy to use, both because it’s incredibly well-designed and intuitive and because it’s filled with on-board help prompts that walk you through every step that you probably won’t even need the user manual. Don’t toss it in the trash, obviously, and keep it as an as-needed reference. But, seriously, even if you consider yourself completely inept where technology is concerned, this machine will take you by the hand and walk you through everything. Normally, in a machine like this, with so much automation and so many features, we take a portion of a point off for the learning curve, but there isn’t one here. It’s the simplest machine we’ve ever run across. You’ll love it, and every other company in the business should immediately copy KRUPS design philosophy here, in our view. Those last two are really important, so we’ll take a more in-depth look at them. Most machines don’t offer user profiles. What that means is that if person A saves their customized drink settings, then later, person B comes along and saves their preferred drink settings, person A’s get overwritten. Each drink can only save one set of customized settings. The Krups EA9010 Barista one touch cappuccino super automatic machine changes that, by allowing you to create up to 8 color-coded user profiles. Each profile you create can save all their favorite drink settings separately. So you can have a profile with your super strong espresso, and if there’s another person living in your household, they can save their preferred settings independently. It’s fabulous, and we wish every company would do this. Note that each profile can store up to 8 customized drink recipes too, so you can save your own Espresso, Ristretto, Cappuccino, and so on. It’s coffee Nirvana. Note that the presence of an independent hot water dispenser opens up a world of possibilities that include teas, cocoa, and other specialty drinks. We’ll have more to say about the hot milk in a later section, but before we do, we want to say a few words about espresso. If you’ve been in the world of specialty coffee for a while, then you probably already know this, so just skip ahead to the next section, but if you’re a newbie, keep reading, and we’ll tell you all about the difference between how espresso is made, versus how the drip-brew coffee you’re used to is made. In all probability, the coffee you’re used to drinking relies on gravity to get from the brew chamber to the pot beneath, then ultimately into your cup. Espresso machines are different, relying on pressure, rather than gravity, and pressure is measured in bars, with one bar being equal to the atmospheric pressure at sea level. 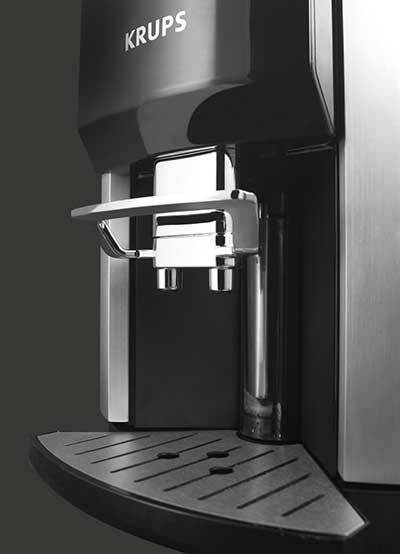 It takes at least 9 bars of pressure to make a good espresso, and the KRUPS EA9010 Barista one touch cappuccino super automatic machine has a 15-bar pump. All that to say it’s got plenty of power to make world-class espresso, every time you use it, and now you know! If we had to pick one aspect of the KRUPS EA9010 Barista one touch cappuccino super automatic machine, it would be the model’s control system, but this would be a close second. We’ve never seen anything quite like it on any other model. In the world of espresso machines, you’ve traditionally had two choices: A frothing wand or an auto-frother. Krups has now given us a third option: The in-cup steaming wand! The way this works is, when you order a milk-based drink, you pour your milk into the cup and place it below the coffee spigots. Sitting unobtrusively behind them is the frothing wand, which will descend into your cup, steam the milk and create whatever level of froth you desire. While you don’t have the hands-on flexibility of a proper frothing wand, you’ll find you can exert a great deal of control by changing your drink settings from the menu, and the amount and quality of the froth the unit produces is amazing. It’s just a matter of tweaking the settings to get them to align with your preferences. We love this feature, and we think you will too! No carafes to plug in, no funky tubes strung all over everywhere, making your kitchen counter look like someone’s high school science project. Everything happens right in your cup, and that’s pretty cool. Before we close out this section in our Krups EA9010 review, we should say something else that American coffee drinkers will like. Specialty coffee drinks were meant to be enjoyed at temperatures lower than most Americans like their coffee. As such, one of the most common complaints we hear about a wide range of models is that even on the maximum temperature setting, the coffee just doesn’t get hot enough. You won’t have that problem here! 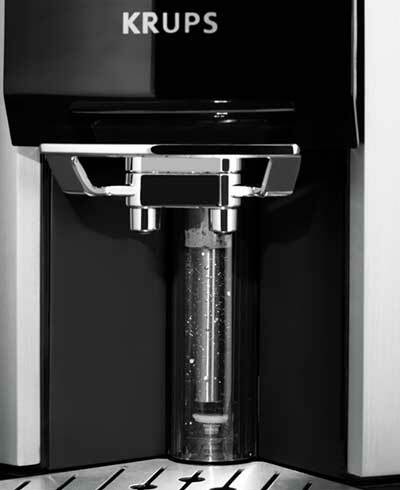 At maximum setting, the drinks this machine produces are every bit the equal of the coffee that comes out of your drip brew machine. The milk, while obviously not as hot as the coffee, is on the top end of the chart as well. The entire front half of the top of the machine is meant to be used as a passively heated cup warming tray, so take advantage of it, especially if you like milk-based drinks. We say this because you can’t steam milk at temperatures as high as you brew coffee, and when you combine your ingredients, you’ll suffer heat loss, which is magnified if you dispense into a cold cup. It’s a small detail, but it makes more difference than you might imagine. If you have doubts, try it yourself and see. 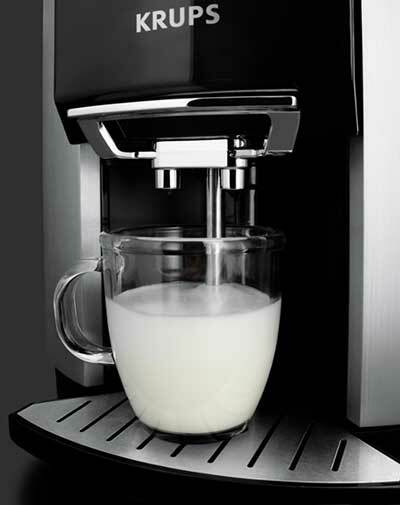 Brew two of your favorite milk-based drinks, one into a cold cup, and one into a pre-heated cup. You’ll be amazed at the difference! 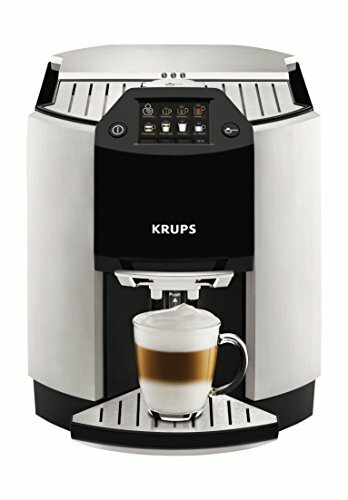 In a lot of ways, the Krups EA9010 Barista one touch cappuccino super automatic machine is like the Apple Computer of PC’s. It’s a hermetically sealed box, so you can’t dig too deeply into it and examine the guts of the machine. When the machine needs something from you, it will prompt you and then walk you through the steps of the cleaning routine, but of course, you can manually run anything you like, any time you want to. In addition to that, every time the machine makes a milk-based drink, it will automatically run a rinse cycle on the frothing system, which is why the machine uses more water than most others. Every 20th milk based drink, it’ll do a more thorough cleaning cycle that will use some of the liquid detergent, which resides in a miniature tank, not unlike windshield washer fluid. When the tank is empty, you’ll get an alert. At that point, you simply swap it out with a full one and carry on. There are two maintenance items you’ll have to do by hand: Emptying the dregs box and the drip tray. Note that the drip tray tends to fill up quickly on this machine because of all the automatic maintenance and rinsing it does. One Coffee Scoop (for the bypass doser) – has a built-in brush! One Cleaning Needle (used to periodically clean the top of the frothing wand) – technically this makes the third bit of manual maintenance you have to do, but this is typically done only on an as-needed basis. We’ve already talked at length about how easy it is to use, so we won’t go over that again here, except to emphasize that, believe it or not, as many features as the Krups EA9010 has to offer, there’s no learning curve to speak of. The interface is that well designed and implemented! As you can see, this machine has a lot to offer, and most of their features are implemented really well. While we did have some complaints about a few things, most of them were fairly minor. The biggest potential problem is the stainless-steel grinder, but as long as you’re not making multiple double shots back to back, you should be okay. Just give the grinder time to cool down between uses. As you can see by the tone of our Krups EA9010 review, we love this model! Even though it didn’t get the highest score we’ve given out, this is easily our personal favorite machine. It offers tremendous value for the money, incredible ease of use, and gives you an enormous amount of flexibility in terms of customizing your favorite specialty coffee drinks. While coffee purists will almost certainly prefer something that gives them more hands-on control, for perhaps 80% of the market (or more), this is as close to a perfect machine as you’re likely to see. Combine that with the fact that it’s made in France, and is offered at an almost shockingly modest price, and we recommend it to anyone, without reservation. It’s one of the all-time great models. Krups USA. Official Brand Website. 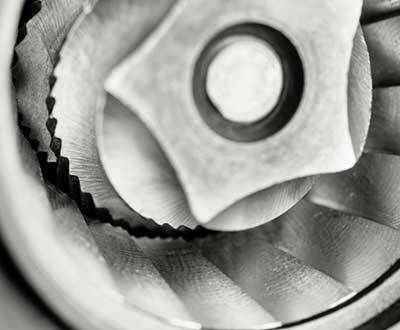 How to Clean Your Burr Grinder. Prima. What Is the Difference Between a Latte and a Cappuccino? Chowhound. How to Froth Milk Using a Milk Frother. One Savy Life.